SKU: HNOEWO200S1. Category: Walnut Oil & Butter. 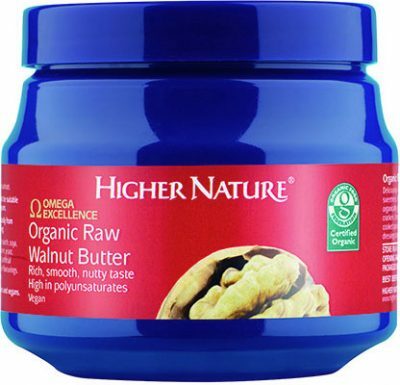 This delicious, unrefined Walnut Oil has a light and delicate, distinctive sweet walnut flavour. Cholesterol-free and 100% certified organic, the primrose-yellow oil is carefully cold pressed from superior quality, raw walnuts, grown organically in Europe, and then filtered. Cold pressing protects the delicate fatty acids inside the nuts and doesn’t involve the use of chemicals. For a wonderful hint of walnut, drizzle this delicious gourmet oil over salads, vegetables, cooked pasta, rice, potatoes and fish. Mix into salad dressings, dips, smoothies, yoghurt, desserts and cold sauces. Tastes great straight from the spoon! Walnut Oil is rich in the Omega 6 essential fatty acid (EFA), Linoleic acid, plus Oleic acid (Omega 9 fatty acid), and alpha-linolenic acid (Omega 3 EFA). Linoleic acid converts to GLA, important for healthy hormone balance, skin, circulation, nerve function and immunity. Oleic acid supports a healthy heart and blood vessels, and may be necessary for healthy immune system functioning. Alpha-linolenic acid converts to EPA and DHA, important for healthy heart, arteries, brain and flexible joints. Drizzle over salads, vegetables, cooked pasta, rice, potatoes and fish. Mix into salad dressings, dips, smoothies, yoghurt, desserts and cold sauces. Take 1-2 teaspoons (5-10ml) a day (adults and children over 4 years). Does not contain added: sugar, salt, starch, wheat, gluten, maize/corn, yeast, lactose, dairy products, artificial preservatives, colours or flavourings. Vegan and vegetarian friendly. Suitable for Kosher and Halal diets. If you are under medical supervision, please consult a doctor before use. Not for use in cooking, baking or frying. Contains nut oil.